Wil Strijbos is a well-known name in the puzzle world, with his metal puzzles being beautifully made, and highly sought after. Not only does he design and sell his own puzzles, but he seems to be able to find rare puzzles which other people, myself included, seem near impossible to find. I have no idea how he comes across some of the items, but all you need to do is to ask. 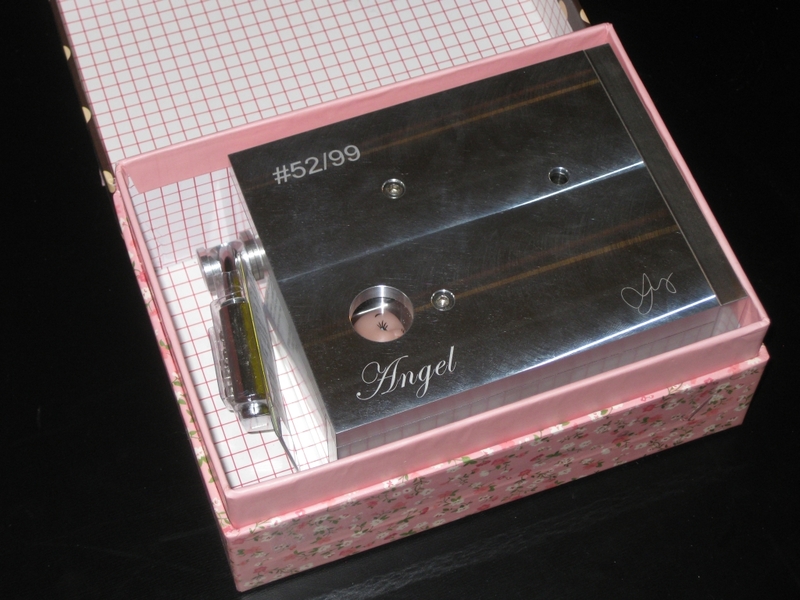 When Wil announced his latest sequential discovery puzzle "The Angel Box" with a fairly long story about its creation, it sounded pretty interesting, and given enough time, one found its way to me. If you've ordered a puzzle from Wil in the past, you'll know immediately when it arrives, as the package is always completely covered in a layer of brown packing tape. After that, there's various quantities of bubble wrap and newspaper to keep the puzzle safe. 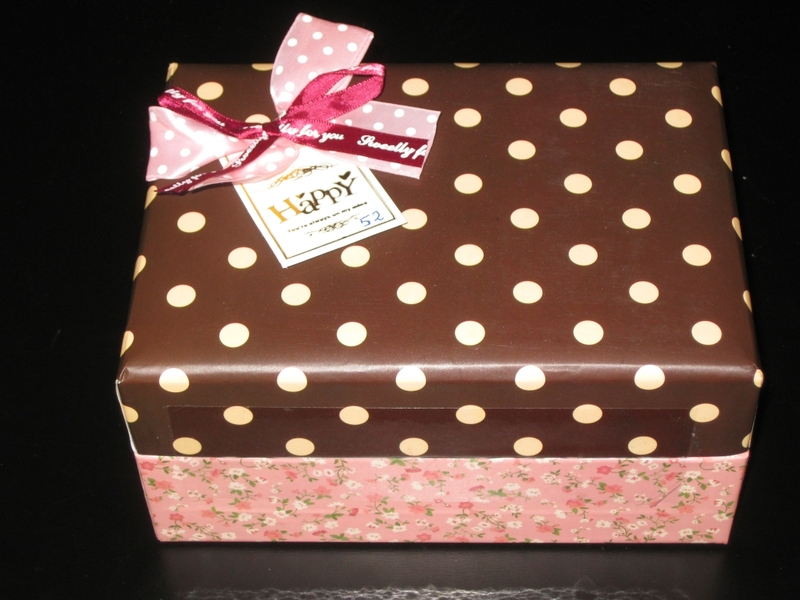 The Angel Box takes the packing one step further, and you'll find the puzzle itself wrapped in the very attractive birthday gift style box, complete with bow and gift tag. As you've probably realised already, this is a big puzzle. At 6.25" x 4.33" x 2.75" and weighing in at a whopping 1.9Kg it's fair to call this heavy metal. Made from some pretty serious aluminium, while the puzzle isn't a solid block, it is solid. I certainly recommend puzzling with this one at the table. Not just due to the potential damage you could do from dropping the puzzle, but also due to the tools that you'll start accumulating as you work through the puzzle. 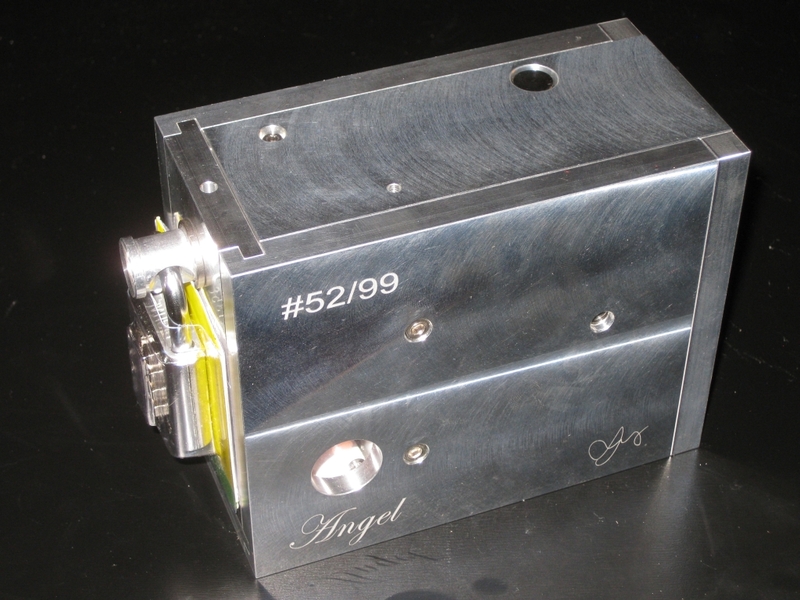 The small peep-hole in the side gives a hint of the goal, to remove the Angel from the box. 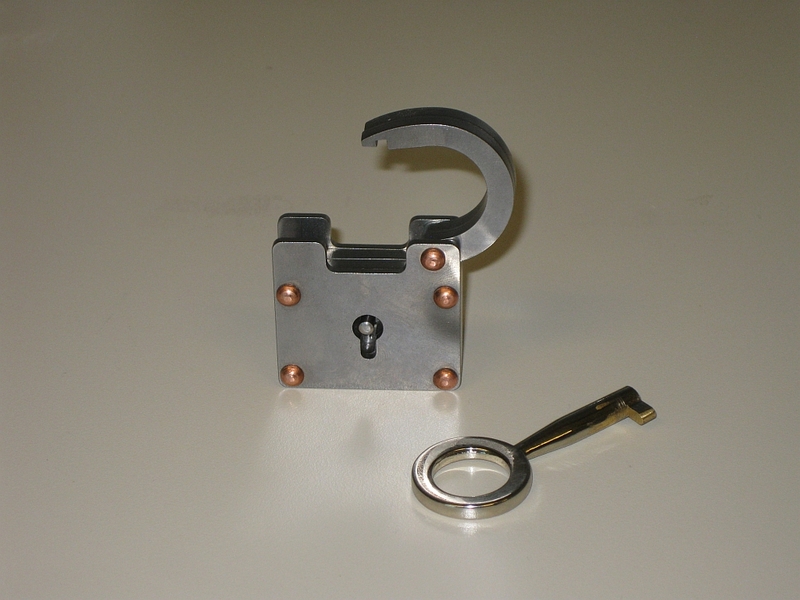 Your first challenge is the padlock on the front of the box, and as you'd expect from a puzzle, the small metal tag held in the shackle doesn't contain the code you need to open the lock. That would be far too simple, and if you've read any of my other reviews of Wil's puzzles, you'll know that opening a puzzle for the first time tends not to be simple! At least the plate gives you the clue that the code is 4 digits which should make life a little easier for you. Before too long, you should have the padlock removed, and be able to make some progress, although it may not seem helpful at first. At this stage, there's not a lot of options to progress, and as with any good sequential discovery puzzle, you'll quickly find a few tools, which in theory should be useful. 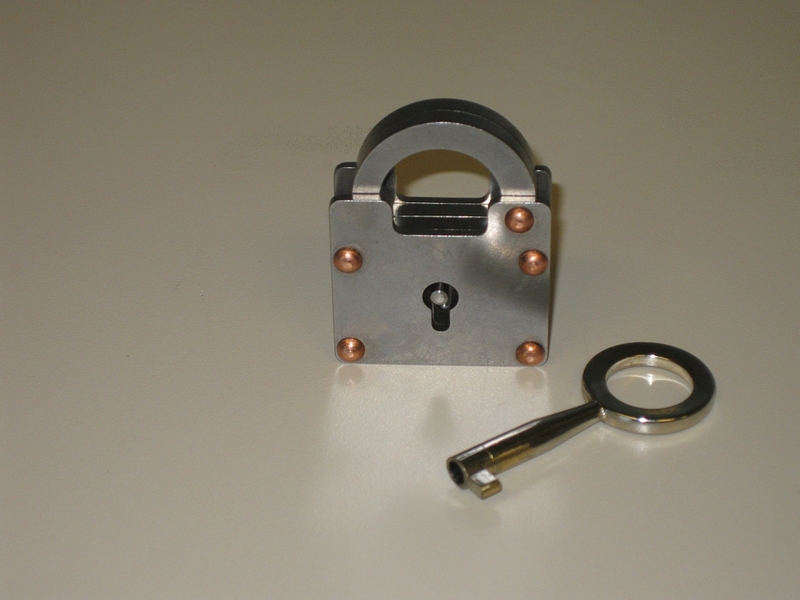 Finding out what to do with the tools you've found is all part of the fun, and take heed from Wil's own guidelines, that the padlock is not needed to solve the puzzle. Don't be tempted to use parts of it in the solution. He gets very upset if you use the padlock as a tool! Looking around the puzzle, you'll find a number of small holes scattered about, and figuring out how to use the tools you have, and the correct sequence to use what you'll find as you explore is the key to progress. There's a great sense of achievement as you discover how the mechanism interacts, and finally make the next step toward progress in solving the puzzle. That's lock #2 down. That done, another tool will almost magically appear, and allow some fairly obvious progress toward opening the box. Lock #3 passed. Then things get interesting, and this is where I lost one of my tools. There's a little flaw in the design of the puzzle, which allows you to lose the tool you need, and potentially prevent part of the mechanism from working correctly. To my mind, it would be a fairly simple issue to fix, but for now, a little care is needed not to lose a key tool. With this part of the puzzle carefully navigated, you'll have lock #4 solved, and the goal should be in sight. The Angel in the centre of the box is within grasp, but there's a final lock, a cage, keeping her locked away. It shouldn't take you long to get past this final lock and release the Angel. Lock #5 solved. With the Angel free, you're not quite done. Freeing her heart is the last piece of the puzzle. A small note located with her will leave you with a final set of instructions... but I'll leave it for you to decide whether to call the number or not. Perhaps Google it first! Overall The Angel Box is a nice puzzle. Far simpler than I had thought it was going to be, and it took me far less time to solve than I had perhaps hoped for a puzzle at this price. Start to finish I had the puzzle open in 10 minutes so it's certainly not a puzzle which will have you stuck for weeks. That said, my solve time may not be representative of the mileage others have had. Now my challenge is whether to display her inside her birthday box, or as the attractive aluminium puzzle that she is outside the box. 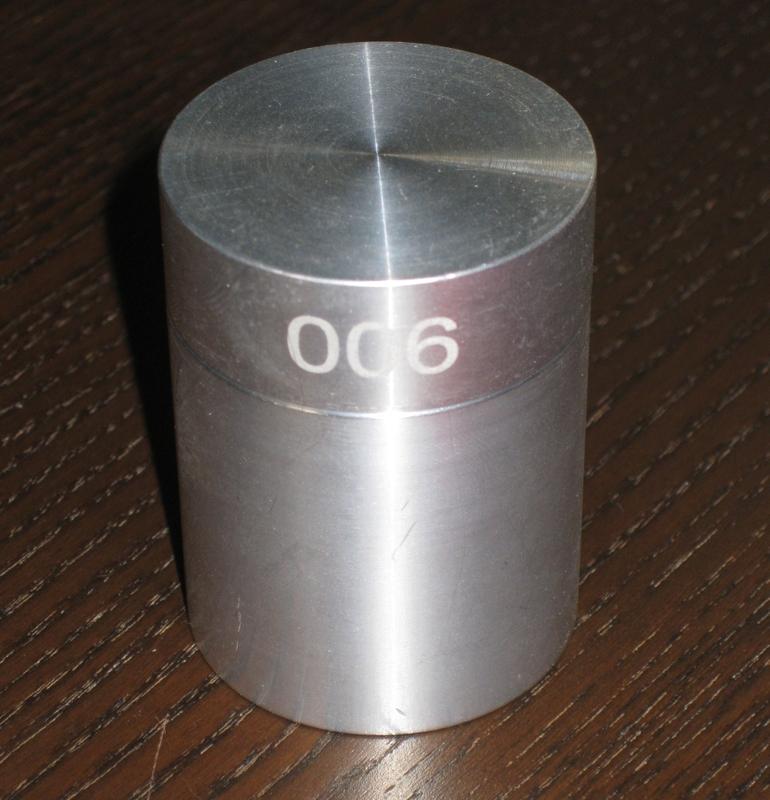 Some time back I reviewed Wil Strijbos' Aluminium Cylinder puzzle after being able to get a copy when he made a second run of them. I'd heard so many good things about it, I really couldn't pass up the opportunity to own one. So when he got in touch to say that the Washer Cylinder was available, a new puzzle along the same lines, I jumped at the chance to add one to my collection. What I'm going to say may be controversial, but I don't like it. Before you start shouting obscenities at me, read on to find out why. The Washer Cylinder is slightly larger than the original Aluminium Cylinder, and unlike the first doesn't have a sprung top. There's a hole in the bottom as before, this time much larger than the original, but this time rather than being able to see into the puzzle, there's a small rod and a washer spinning freely around it. Not all versions have this rod, as the original prototypes had a coin in there instead. It doesn't affect the puzzle in any way, so really doesn't matter which version you have. (I'll come back to that later!) The lid spins freely, VERY freely, but other than that there's not much else to see here. As before, the number on the 'lid' of the puzzle is the version number of the puzzle in the run Wil made, but this time, there's no accompanying mark on the main body of the puzzle. That's the first clue that this is a different beast altogether. Much like the first puzzle you can hear something rolling around in there, and you'll probably guess that it's ball bearings. Pretty much everyone I've talked to has some theory about how many BB's are in there ... and we were all wrong. If you've played with the Aluminium Cylinder then I truly think you're at a disadvantage. You know how that works, and whether you like it or not, you're going to try the same things in the vain hope that it will help. It won't but even after reading this, and the many other reviews, you'll still try! So why do I not like this puzzle? Well the answer is pretty simple. There is absolutely no feedback while working on the puzzle that you're doing anything right at all. The tolerances on the puzzle are so fine that you have to perform the solution exactly for it to work, otherwise, nothing will happen. Given that, I really don't find it a satisfying puzzle. The first gave you feedback, confused you as the BB's appeared and disappeared in the hole in the bottom, and delighted you when you solved it and the top popped open with a satisfying sound. For me, this puzzle has none of that. Allard recently wrote a post about what makes a good mechanical puzzle. For me personally, getting some feedback from the puzzle that you're making some progress (even if it turns out to be negative progress) is very high on my list. If you've not read it, then I'd suggest having a look at Allard's thoughts as it was a good read! Now I know the opinion above is not the opinion shared by the others who've reviewed it, it is my feeling, and I've always been honest in my reviews. Have a look at what Allard, Jerry, Kevin, and Oli have to say. Now having told you why I don't like it, I do think it's a very clever puzzle. The mechanism is simple, yet deceptive and it does work flawlessly every time. Despite the instructions from Wil, I'd disagree that no force is required. There's no force required initially, but the final step may require a little force to start the opening process. It's not excessive, but having said 'no force' may lead some people not to make that final step towards opening it. When you're putting the puzzle back to the start position, it's possible to get things stuck if you turn the puzzle over and the washer drops off the rod. Not a big problem, but something to keep in mind! Being one of the first 20 people to be sent a copy of the puzzle from Wil, he kept in touch and I was aware of a lot of discussion around the puzzle. Wil was great at keeping in touch, and sending out updates as to when various puzzlers had solved it. As such, I was aware of a number of reports of issues being found. Sadly, given the tight tolerances, and the nature of metal on metal there were some cases where the puzzle got jammed, and as a result it was possible to open the puzzle without going through the intended solution. Wil was actively looking for input and thoughts on the puzzle, and I think he's looking at improving the design, so fingers crossed this will get better in future copies. Despite what I've said, I do think it's a nice puzzle, and I am happy to have one in my collection. It's beautifully made, and the work that went into it is clearly the high quality Wil always makes. Would I recommend it to someone else? No, I really don't think I would. I'd say get the original, as I personally think it's a far better puzzle. 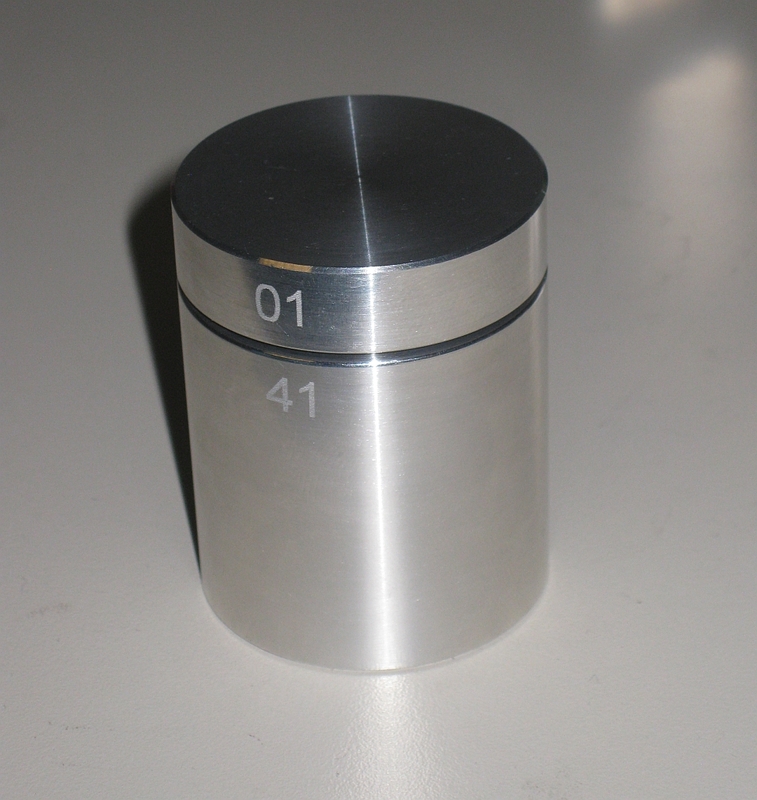 The Aluminium Cylinder is another intriguing puzzle from Wil Strijbos in the Netherlands. Wil has been making metal puzzles for quite some time now, and the quality of his work is excellent. Have a look at my review of Wil's first ever puzzle design The Aluminium Cross, to see where it all started. When I started playing with this, I didn't seem to make a lot of progress. The puzzle will go silent as you move it around in your hands, then you hear things rattle when you press the lid down. None of this seems to do much other than confuse. After a while I managed to do something useful, and a ball bearing appeared in the hole in the middle of the puzzle. I confess that at this point, I had no idea what I'd done, or how to replicate it. Turning the puzzle upside down and looking in the hole, I watched the ball bearing disappear into the feature at the top of the hole, and it was gone again. Some time later, I finally figured out what was going on, and a few minutes later, the lid popped up with a satisfying sound. Once open the locking mechanism is fully visible, and you'll be amazed as to just how simple it is. This is a wonderful mechanism, and my hat is off to Wil for creating this. Reversing the opening process closes the puzzle, and returns it to its starting state, ready to confound the next unsuspecting puzzler. I can now open the puzzle in around 10 seconds, however shutting it still takes me a little longer. For some reason it's not as simple to close as it is to open! This is a great puzzle, and highly recommended for any puzzler. Be warned though, this may take a lot of time to solve! 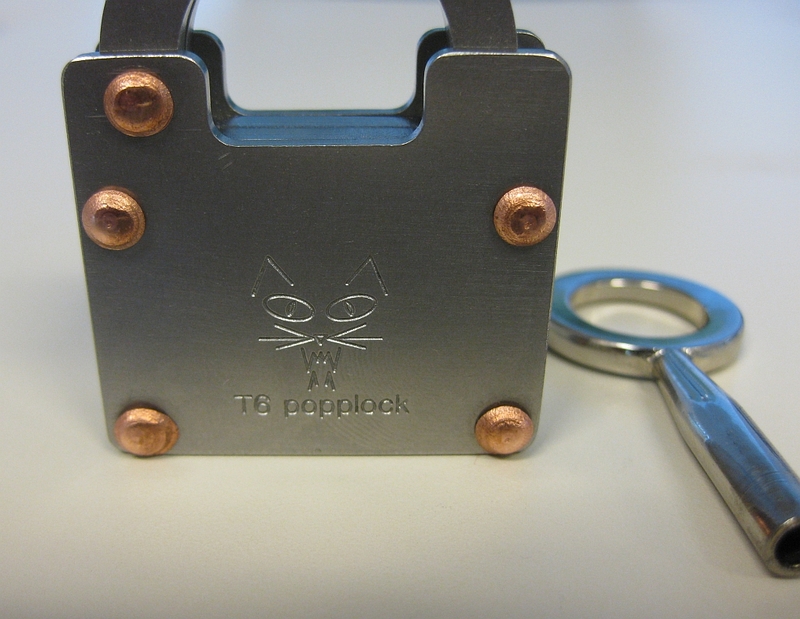 The Popplock T6 is the latest trick lock to be made by Ranier Popp. This review is a little special as it's the first video puzzle review I've done. Things are a little rough round the edges, and if you like it, then I'll do more, and hopefully they'll get better over time. Despite what I say in the video, the rivets are copper, not brass. Sorry. The T6 is 1.5" square and comes in two different versions. 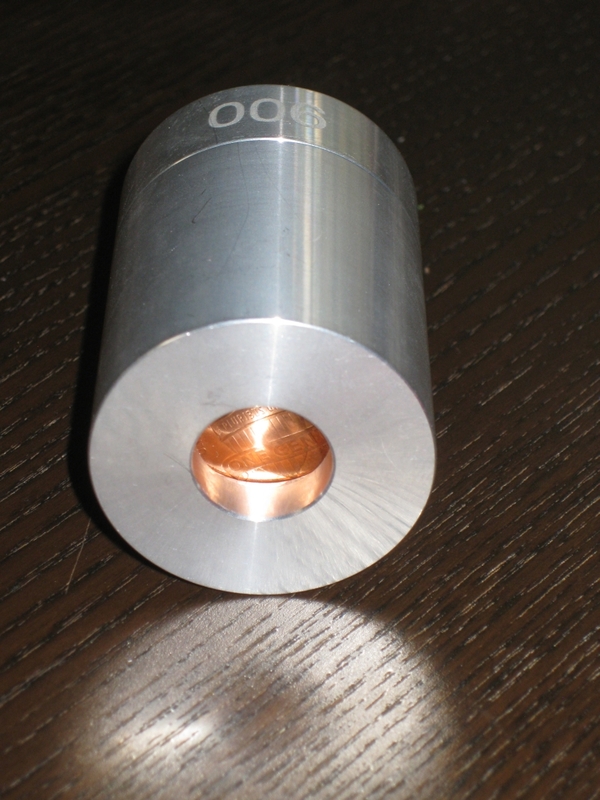 A copper riveted version, and an aluminium riveted version. The mechanism for both is the same, and it's only the external appearance which differs. Personally, I really liked the copper look so decided to get this version for my collection. An interesting note is that the direction the hasp opens is mirrored between the two versions. You can see the differences on Ranier's site here. I bought mine through Wil Strijbos, and jumped on the chance when he mentioned he had some available. They are also available currently from Puzzle Master. 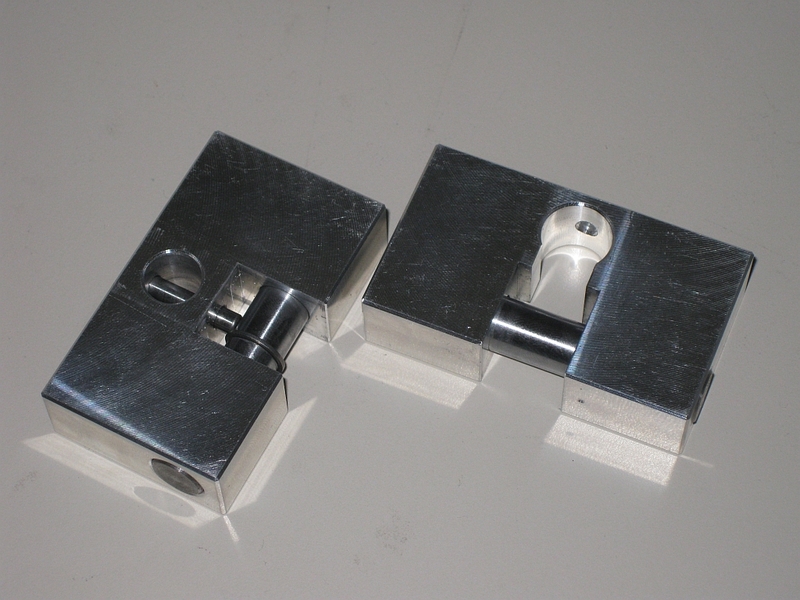 The lock is constructed from stainless steel and as a result is fairly heavy, and very solidly built. There's no worry about damaging this lock if it's dropped, or passed around for people to play with. The key supplied looks to be brass (some of the silver plating on mine has rubbed off) so you know they key is solid too, and no chance of it breaking, unlike some early Popplocks where the keys weren't so robust. As you'd expect all the tools you need to open the lock are included, no paper clips or acetylene torches required. The back of the lock sports the familiar feline Popplock logo engraved into the lock, and the copper rivets mirror those on the front. I freely admit that I'm no expert on solving trick locks. This is the first Popplock I own, and only the second trick lock in my collection. I took a fairly systematic approach to the puzzle, poking and prodding the rivets and anything which may not be as it appeared before putting the key in the lock and turning it. The movement of the key in the lock is very smooth, and there's no real feedback turning the key in either direction. Not to mention that turning the key in either direction doesn't open the lock! I can tell you're surprised by this news. Fairly quickly I noticed that there are two levels the key can be inserted at, and two 'discs' inside the lock which the key turns. The key can only be removed when the top disc is back to its starting position, but the bottom disk can be left at any point. Turning the key you notice a small notch in the upper disk. Surely that is important. Investigating further I found a similar notch in the lower disk and also a dot on the disk. With these reference points, I started to get a feel for what was required to open the lock, but I still had no idea how to execute it. It took around two hours and a lot of trial and error to figure out how to open the lock, and all I can say is that it's a clever yet simple mechanism. The mechanism is very cleverly disguised and really requires you to examine everything and assume nothing. As Ranier Popp states on his website, it's not easy to solve. I highly recommend this puzzle, and if you're new to trick locks, or to the Popplock series, this is a great puzzle lock to own. I may have to hunt down the rest of the series now! As I mentioned previously, I was lucky enough to be able to pick up a copy of this re-run of Wil Strijbos' first ever puzzle design, the Aluminium Cross. John Devost over at Puzzle Paradise had been in touch with Wil to get a few for the US collectors, and I bought mine through John. Wil Strijbos is a fairly well known puzzle designer, creator and collector from the Netherlands. He has a huge collection of puzzles, and has been designing puzzles himself for quite some time. Wil has a number of glass bottle puzzles (which Oli has reviewed here and Allard over here) and nut/bolt puzzles he designs and makes, but perhaps his most notable works are his aluminium puzzles. Just by looking at these puzzles, it's easy to see why, they really do look good, they're well finished and are just a little different to many other puzzles on the market today. You can read Allard's review of Wil's Aluminium puzzles over on his blog and Kevin's over on PuzzleMad. Since Wil makes these by hand, there's never a huge number of puzzles available, however he does take requests, and has a catalogue of other puzzles for you to buy while waiting on one of his puzzles. 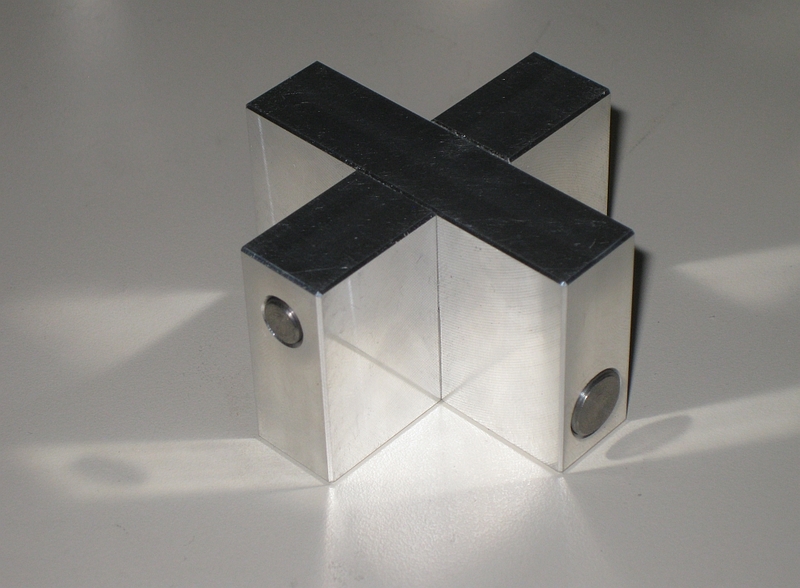 The Aluminium Cross was created back in 1980, when Wil was invited to meet Mr James Dalgety from Pentangle Puzzles after writing to Pentangle about their puzzles. He felt that with such an invite he should create something to take with him. Back in 1980 he made only a few samples of the puzzle, and it has taken 32 years for him to make it available on a larger scale. Looking at the puzzle, it doesn't look very challenging. There are two bars of aluminium and two rods going through them, so it shouldn't be too difficult to take apart? It's at this point it's worth noting that when Wil announced the availability of this puzzle again, he showed pictures of the puzzle open and closed. That's right ... he shows the puzzle open. Anyone who is able to show you their puzzle solved, and it still be a challenge to take it apart has a good puzzle on their hands. For that reason I don't hesitate to do the same in this review and show you the same as Wil did. Even having seen the puzzle already apart, I can confirm that there are no clues there. If anything all it does is serve to intrigue and confuse. I know having seen the images from Wil himself it just made me want one even more. When I received the puzzle, my parents were over from Scotland on Vacation, and my Dad who is also a puzzler was quite interested as well. At first, everything is locked solid and none of the pieces will slide. Over dinner, I sat and played as we talked and gradually by twisting and turning the puzzle, first one bar moved, then after more work I could remove it. Yet more work was required to finally take the two parts of the cross apart and see how the puzzle was constructed. I will admit that I wasn't paying as much attention as I normally do when solving a puzzle given that I was enjoying dinner with my family. To my surprise I had taken the puzzle apart in under 15 minutes. And that is where the fun started. I had to put the puzzle back to the start, so my Dad could open it. I then spent the next 40 minutes trying to work out how I had taken it apart to be able to put it back to the starting position, and ended up having to take it apart again several times to see how each of the elements interacted. My input to the dinner conversation was significantly less than it had been while I was opening the puzzle, and there were a few grunts as the puzzle eluded my attempts to reassemble it. This puzzle is just as challenging to restore to its original state as it is to take apart. In all there are six elements to the puzzle which need to be understood to solve it. It's a great puzzle, and as a first design it makes my efforts seem fairly meagre. Having handed the puzzle to my Dad, he opened it fairly quickly, but ended up handing it back to me to put back together. I've given it to a few other friends and they have all enjoyed playing with it and agree that it's a great puzzle. The first run of the Aluminium Cross sold out very quickly, but I know Wil has batch two ready and I have no doubt that if they continue to sell well he'll make more. I'll be reviewing Wil's other aluminium puzzles soon, so stay tuned for more from Wil Strijbos. If you'd like to purchase any of Wil's puzzles, or find out what other puzzles he has in stock, feel free to get in touch, and I'll send you Wil's details. He currently doesn't have a website, but does maintain a mailing list with lots of info. Despite the slightly cryptic title, many puzzlers will already know what I'm talking about. Hailing from the Netherlands, William Strijbos is a name familiar to many puzzlers. 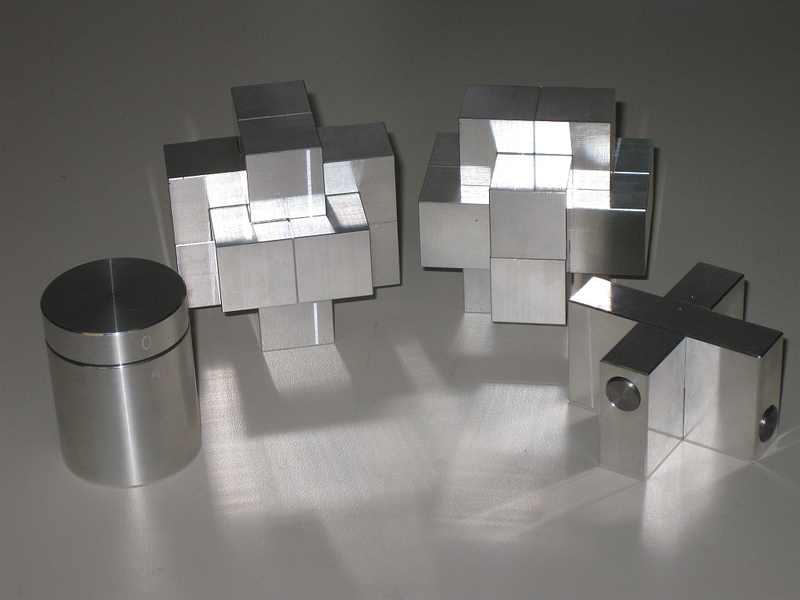 His aluminium puzzles are probably his best known, but by no means his only puzzles. Wil also designs bolt puzzles as well as a fair share of coke and whisky bottle puzzles as well. 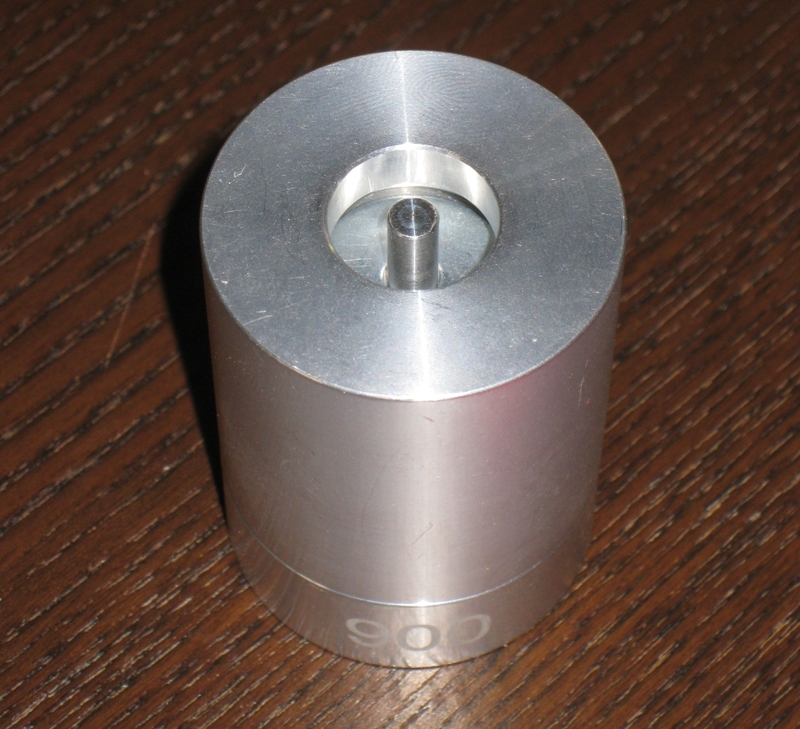 I recently purchased Wil's Cross puzzle from John Devost through Puzzle Paradise and at the same time had ordered Wil's Aluminium burrs and his Aluminium Cylinder directly from Wil. I've had the Cross for a few weeks now, but at the weekend, the rest of the items arrived from Wil. As much as Wil knows about designing puzzles, he also has a good supply of packing tape, as there was no box visible on his package, it was so well covered in tape. Guess Wil was expecting rain as this one was watertight! I'll be reviewing all of these fairly soon, so keep an eye out for that, but until then, rest assured that these are excellent puzzles, and well worth owning. If you are interested, drop me a message and I can pass on Wil's details. If you're interested, despite the identical external appearance, the Burr on the left is the 10 move burr which is a version of the 'Piston Puzzle' by Peter Marineau and the one on the right is a version of 'Gaby Games' designed by Phillipe Dubois. All the puzzles are incredibly high quality, and beautifully made. Well worth having in the collection. While the Burr's are not new designs, their construction from Aluminium does add to their appeal, and the fit is excellent, making them worthy of note.